A celebration of the life of Burnham Ford “Burnie” Martin, beloved husband, father, grandfather, friend, musician, outdoorsman and businessman, will be held at The Church of the Wildwood, at 347 Holden Road, in Chittenden Vt., at 12 noon, on Sunday, March 11, followed by a refreshments and a musical gathering. His ashes will be distributed eventually by close friends and family in places of beauty and special memory. A summer musical gathering will be held as well, with date and time to be arranged. Burnie Martin passed, after a wonderful and happy life, at age 84, on March 5, 2018, at his home in Chittenden, attended by loved ones. He will be remembered with hearts full of gratitude and love by his wife, Donna; his children, Bill, Rebecca, Doug and Chuck; his son in law, Jeff; his daughters in law, Kristen and Erin; his grandsons, Wyatt and Charlie; his granddaughter, Maisy; his grandchildren by marriage, Jason, Darrah, and Christy; and his five great granddaughters by marriage, Kayli, Ashlynn, Brooklyn, Alyssa and Sydney. Born in Ohio, Martin began his business career at his father’s firm, Martin-Metcalf. He graduated from Dartmouth College as a member of the class of 1956 and went on to enjoy a successful real estate career, creating the first real estate company in the Killington/Pico area, Martin Real Estate, in 1964. This became Martin Associates, which he ran together with Charlie Wise and Walter Findeisen until his retirement. He participated in the “JCs” Junior Chamber of Congress in Ohio, and was active with the Rutland County Board of Realtors, and Chamber of Commerce. He also served on the Sherburne Volunteer Fire Department. Burnie Martin chose a 200-year-old farmhouse in Sherburne, (now Killington), when he moved to Vermont, where he could share his love of the outdoors with his wife and raised their children in what he called “a good place to be from,” eventually moving into a custom built dream home in Chittenden in his 70s. He loved to bring out the best in people, and made the most of every occasion. He will be widely remembered for his love of family, music, the out of doors, kindness, ingenuity, integrity, contemplative conversation, and happy, joking fun. 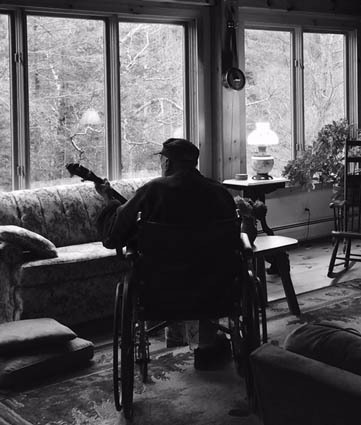 Burnie was always known to be whistling and humming, strumming the ukulele, mandolin or banjo, enjoying a sunbeam or a crackling fire as part of his everyday life. As an entertainer, he played and sang with the Pot Luck Singers, together with his wife, Donna, and close friends Jack Harrington, Allan Bounds, and Bob Smith. He also sang annually at Messiah Chorus events, and took part in frequent open mic nights and other musical gatherings for every occasion, wherever he happened to be. The family wishes, at Burnie’s request, to express their deep gratitude for the kindness and skill of the doctors, health care, home care and Hospice workers who have aided Burnie’s family so very much.